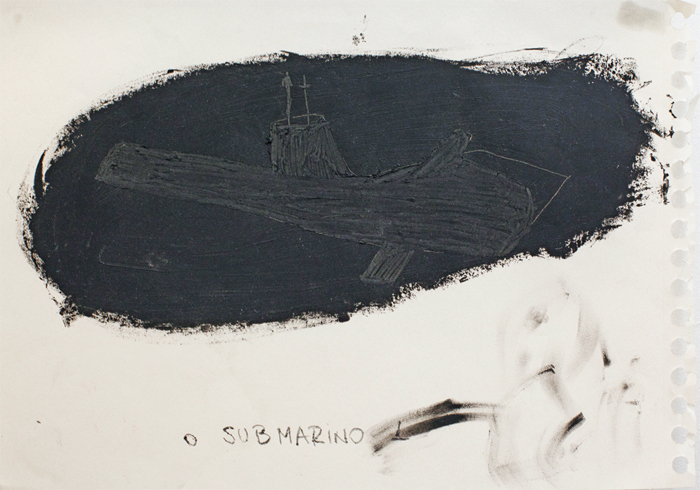 Renata Har, Submarine, 2012, drypoint print and oil pastel on paper, 8 1/4 x 11 3/4". Renata Har’s Podium, 2014, consists of a found section of green cardboard wallpaper that was damaged in a Berlin apartment fire and left in the street. Nailed to the wall, this tattered object clearly shows smoke damage on its bottom edge, which is folded up slightly, forming a precarious shelf for a pile of black glitter. But rather than sparkling, the glitter seems matted together, almost slimy, like wet ash. In the gallery, it has gradually accumulated on the floor below. In counterpoint to this fragile hanging object, In the Tall Grass Crickets Sing, 2012, offers a similarly folded and dilapidated piece of butcher paper in a protective vitrine mounted on the next wall. Whereas in Podium, an accidental footprint speaks to the object’s former life, this work bears its title and drawn lines printed via monotype. 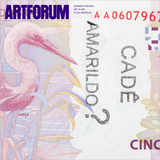 Order the PRINT EDITION of the May 2014 issue for $17 or the ONLINE EDITION for $5.99.